insights, humor, and interviews. Cover art by the great John Holmstrom. for them, Arturo designed the Presidential Seal logo. Wanna learn how to play Ramones songs? - this place has tabs for all of their songs! Check out Jay's new children's book: Otto's Orange Day. My kids & I love it...it has a great message!! Gooney Bird Kids and Kids' Music that Rocks...let us know if you have a cool blog and we'll add a link! RADIO: All of the below stations have podcasts - so you can listen any time you wanna. Spare the Rock, Spoil the Child is a long-running and fantastic show! The Saturday Morning Cereal Bowl is awesome! RETAIL: The Pokey Pup carries a lot of great indie kids music, like the Boogers! 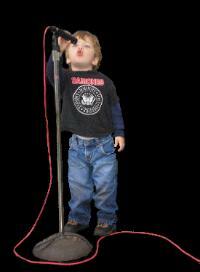 Get the greatest rock n' roll gear for your kiddos at Psychobaby!! OTHER: Not just music, but an incredible resource for hip parents: Otterhop!